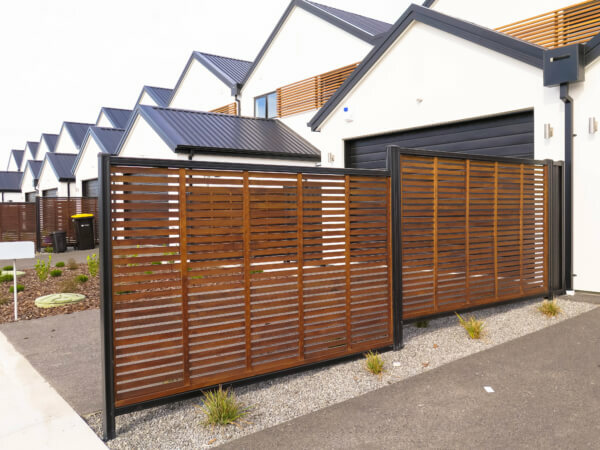 Nothing beats a beautiful timber fence or gate for pure aesthetic class. Our timber fencing comes with a high-quality finish which includes a wide range of finishes, available in the colour of your choice, including four-coat paint or staining. As well as being stunning, they are also simple and quick to install, with adjustable brackets to fit any slope or corner angle, and supplied as a modular system, ready to simply fit together. Created with premium grade timbers, our custom gates are manufactured to a high standard by experienced craftsman using proven and timeless techniques. Built to last, our timber fences and gates don’t warp or twist, delivering exceptional quality and functionality for many years to come. Our Post and Rail fencing systems are our most popular, being cost-effective, looking great, and perfect for the lifestyle property or country farm. Available in treated pine for guaranteed durability or chemical-free naturally durable macrocarpa, installation couldn’t be easier. Simply set up the posts and slide in the rails, and you’re done! The fencing was the best we have seen. Very nice to use, brilliant finish and the boss is pleased. We’re stoked and will always be recommending it to others. Yesterday we saw for the first time our fabulous swimming pool fence made by Boundaryline and it is brilliant. I love the fence and gates! The team were great to deal with and the result is impressive. We are delighted with our Boundaryline fence. It was a joy to build and we continue to enjoy its good looks. Its contour and length certainly enhances our property. They made a lovely job of it, it is made from good materials, Macrocarpa, and they (Terranota) are quite a good crowd to deal with. It is going to be there for a long time. I am 60-years- old and it is going to see me out. We are very impressed with your product. We’re thrilled with the product; we’re very impressed with the timber. Very impressed with the bottle of wine and the post level – it’s just great service and it’s those little things that count. The fence looks great – the client is very happy. Cheers for the gifts Jay and thank you for the supply of timber right on time, I will keep in touch and also spread the word on how well you have treated us. Gates are up, going and looking good, I will send you a photo, thanks for your help. We are so proud of our fence ! I think it is the BEST answer for small lifestyle blocks. We’re here Mon-Fri, 7am – 5pm (and often outside of these hours). The team at Boundaryline would love to keep in touch with you by sending you our Monthly newsletter, enter your name and email here and be among the first to hear about our latest projects, inspiration and products! Would you require someone to install the fence for you? How did you first hear about Boundaryline Fencing Systems? 12+48=? Please leave this field empty.